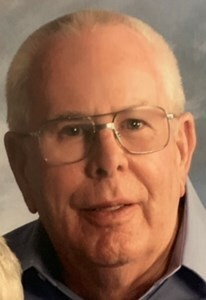 Thomas K. Olsen, 86, of Green Bay beloved husband of 63 years of Ann (Moreaux) Olsen, departed this life peacefully on Thursday, April 4, 2019 at Odd Fellows Home surrounded by his family. Tom was born on September 14, 1932 in Green Bay son of the late William and Gerda (Jensen) Olsen. He was a graduate of Green Bay East High School. On June 25, 1955. Tom married Ann Moreaux at St. Paul Lutheran Church in Green Bay. He served in the Army National Guard. Tom was a long time employee of H.C. Prange Company. He and Ann are longtime members of Grace Lutheran Church. Tom is survived by his wife Ann and their twin boys, Michael (Peggy) Olsen, and Patrick (Kay) Olsen. He is also survived by his brother, John (Denise) Olsen and brother-in-law Fred (Karen) Moreaux. Tom also leaves his beloved grandchildren: Nicholas (Lauren) Olsen, Kari Olsen, Steven (Amy) Olsen, Andrew Olsen, and Laura (Jonathon) Champeau, along with four great grandchildren: Quinn, Evelyn, Bria, and William. Tom also leaves several nieces, nephews, extended family and friends. He is preceded in death by a sister, Karen (Donald) Besson and sister-in-laws, Corrinne (James) Millard and Janet (James) Coniff. Visitation will be held on Tuesday, April 9, 2019 from 9 AM - 11 AM at Grace Lutheran Church in Green Bay with a service celebrating his life to follow at 11 AM. Interment will be in Fort Howard Memorial Park. Tom's family wishes to express their deep gratitude to the staff of Odd Fellows and Unity Hospice for the wonderful care given to Tom. They further wish to thank the many families and friends who supported them throughout this time. Add your memories to the guest book of Thomas Olsen. Tom and Ann were dear and favorite customers to Willow Street Bakery. We offer our deepest sympathy and prayers of peace and comfort to your family. We are so sorry to hear about Tom's passing. We know he will be missed by all. I was so sad to hear of Uncle Tom’s passing. I have such great childhood memories of all the family together and summer vacations spent with the Olsens.